Amazon’s recently news about the European distribution of their eBook reader, the Kindle (a groundbreaking success in US last year) mounted quite a buzz here in Italy (the country were I currently live): it’s the first official move from the US ecommerce giant here, and took everybody (I have at least a friend who largely previewed this sometime ago) somebody by surprise. Back to the title of this post I’d say that not only I won’t buy the Kindle, but – at the current conditions of offer, price and general country-based context – I’m not going to buy any kind of reader for ebooks. To all my ebook lover guys I’d like to say that in this post I won’t base my choice on the values of the paper book, on beauty of the smell of the cellulose based paper, on my love for libraries as social gathering shops etc. etc. since I don’t think these are real and serious matter of facts to base my view on. Even more: I completely disagree with those who say they won’t use ebook readers because they love “real” books. Are you still using vinyl discs to listen to your music? The parallel is really strong. I’ve got two reasons: one is technical (let me say: ergonomics and overall user experience); the other is, well, about money. Thanks to a marketing initiative of the nice guys at Simplicissimus Book Farm last year I had a chance to give one of the ebook reader they sell a test drive. Great product on the technical side (let me call this the geek side of the Force ) but too many flaws on the ergonomics side. You can read about my test and opinions here. During 2009 I’ve bought 14 books (some in Italian, others in English) at a medium cost of 15 € each for an yearly amount of 210 €; if they were ebooks (at a supposed price of 9,99 € each) I should have spent 140 euros (with a -70€ gain). My yearly reading book consuming capacity, calculated – for statistics sake – over the last 3 years of Anobii usage, stands between 15 and 20 completely read opened books per year (no reference books, no abandoned books). I don’t think I’ll be able to override this capacity in the – let’s say – next two years. The Kindle costs (with taxes) 217€ which means I’ll break even after (217€ per year/70€100€) 32 years, which in my humble opinion is way too far over the Kindle’s lifecycle. It really doesn’t matter I could store 1000 and more books on the device because I really don’t need them. 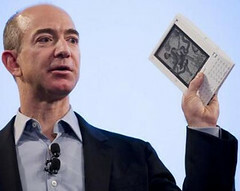 The kindle is not the iPod for books: you consume a song in 3 mins, but a book lasts at least for a week. From this point of view it’s ok to buy a song on the go and over the air and listen it for just one time, but I’m not interested in buying a book while I’m standing at the train station for my travel readings. Am I against this ebook/ereader stuff? Really not! I just don’t think they’re at the moment as good as they should be for private use. But I’m thinking on introducing them in next year Frontiers of Interaction conference. This entry was posted in Beef and tagged ebook, frontiers10, personal, user experience by admin. Bookmark the permalink. The new iRex reader looks really a nice improvement (I see a pen on the photo; I’d say that pen-touch is a kinda *old* technology now. Is it going to accept fingers as device inputs?). Back to the Math: I probably need to contextualize my numbers (eg: when I say 3 hrs/day I haven’t accounted for travel-but-not-reading times, for example the time spent walking from the office to the train station is considered “travel time” but which cannot be spent reading). My point is that I’m spending as much time reading as I can, and Anobii statistics speaks by themselves. but I accept your objection to include reference books to; I’ll redo the math on this. iRex says finger touch would require more power to the matrix and thus both loss of battery life and of the comfort for the eyes. On the other hand, I subscribed to the pdf version of Il Fatto Quotidiano saving more than 100 euros compared to the paper version, and I can enjoy it fully on my ebook reader, with no risk of misdelivery. In fact getting easy access to ebooks of otherwise hard to find books was the selling point to me, rather than sheer saving; although I’m saving more than you, because I’d have to add (international) shipping to the price of the books I buy the most. Parvati, given the reason you’re saying for iRex not switching to finger touch, I’d really say iRex people to research for another battery technology to improve their product! (oh, and by the way they should also take a look at the “iPhone style” Barnes and Noble upcoming ebook reader. And again you’re right when saying that I should have counted shipping costs, but they barely modify the situation since I usually mass order books (4/5 per shipping). what about having always with you the books you need? I usually need 3-4 books at a time, one is for pleasure, the other ones are for technical reference. I could not, before having the fantastic kindle, have all of the with me, now I can. I’m sorry for this link.